Presser — The Fender Custom Shop in Corona, Calif., is proud to introduce a very special series of limited edition instruments issued in celebration—or rather “Tele-Bration”—of Fender’s very first solid-body electric guitar, the Telecaster, which has reached its 60th anniversary in 2010. The Custom Shop’s 60th anniversary Tele-Bration series commemorates the very earliest models of what would by early 1951 be called the Telecaster. The five Tele-Bration guitars present finely crafted reproductions of several of Fender’s most collectible historic instruments—each limited to 60 guitars—and will be released sequentially beginning in summer 2010. Further, each guitar comes with a Custom Shop Tele-Bration ring notebook containing yellow legal pad copies of George Fullerton’s handwritten notes about the history of the Telecaster’s very earliest days. The 60th Anniversary Limited Telecaster Proto is the first to be released; a reproduction of the prototype guitar that Leo Fender himself took around clubs for artists to try in 1949 and early 1950—and as such the one that started it all. 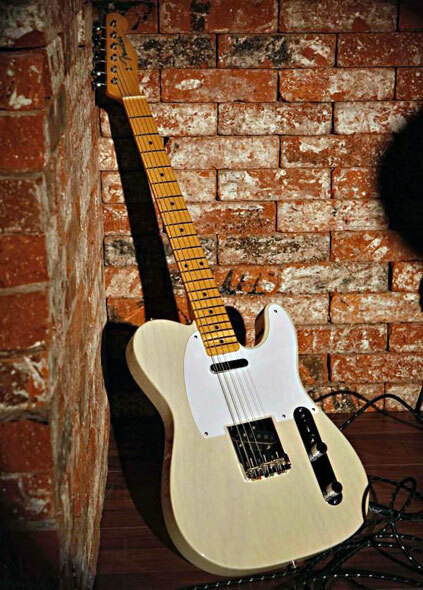 It was from this unusual instrument that the Telecaster blossomed and changed music forever, and the reproduction features a pine body with an aged white nitrocellulose lacquer finish, three-on-a-side “snake-head” tuners and headstock shape, single-piece hard rock maple neck with no truss rod, vintage wiring, custom-wound pickup and an authentic reproduction of George Fullerton’s signature on the back of the headstock. The 60th Anniversary Limited Broadcaster guitar is a reproduction of one of the most collectable Fender guitars ever. Originally, only about 200 were made before the Gretsch company sent a telegram on Feb. 20, 1951, asking Fender to change the name because Gretsch owned the name “Broadkaster.” This is the very first time since then that the guitar has been reproduced with the original logo. The 60th Anniversary Limited Nocaster guitar replicates one of the rarest of Fender instruments—the so-called “Nocaster.” After Gretsch asked Fender to drop the Broadcaster name, Fender simply cut the decals so that they read “Fender” only. 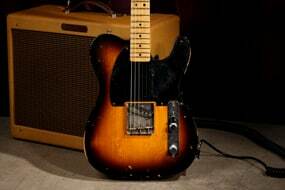 These guitars were made until the Telecaster name was introduced in late February 1951, and it is believed that only about 475 such guitars were produced. The 60th Anniversary Limited Single-Pickup Esquire is a reproduction of the single-pickup instrument that actually bore the distinction of being Fender’s first venture into the marketplace. Named the Esquire in April 1950 and introduced into full production in January 1951, it immediately caught the ear of many guitarists and put the design on the path to making history in earnest, especially with the advent of a two-pickup version introduced very soon thereafter. The 60th Anniversary Two-Pickup Esquire replicates Fender’s earliest dual-pickup “electric Spanish guitar” model of 1950, which added a second pickup near the neck that allowed guitarists to play more effective rhythm parts. This instrument would soon become known by a different name that changed musical history and endures to this day. Fender Musical Instruments Corporation (FMIC) is the world’s leading guitar manufacturer, and its name has become synonymous with all things rock ‘n’ roll. Iconic Fender instruments such as the Telecaster, Stratocaster, Precision Bass and Jazz Bass guitars are known worldwide as the instruments that started the rock revolution, and they continue to be highly prized by today’s musicians and collectors. FMIC brands include Fender, Squier, Guild, Tacoma, Gretsch, Jackson, Charvel, EVH, SWR and Groove Tubes, among others. For more information, visit www.fender.com/customshop.